We took a short break in Whistler, and to reduce the cost (renting a bike there costs $45 a day) we put the bikes on the rack on my Yaris. Despite it having a small fuel efficient engine, and having to climb the Sea to Sky the extra weight and wound resistance was barely noticeable, and the Horstmann House includes bicycle storage among its facilities – as well a wi-fi which I did not get to use very much! 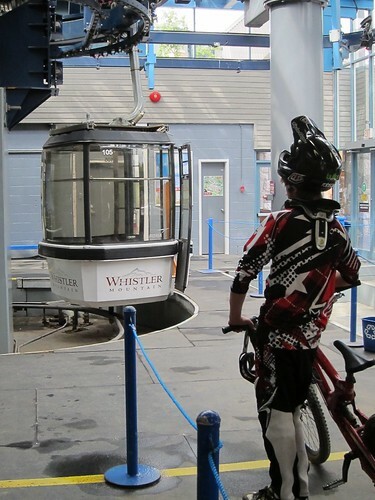 Bikes in summer are Whistler’s stock in trade – just as skis and snowboards are in winter. A lot of young people like coming down the mountains at fearsome speeds on expensive little bikes with disc brakes. They of course have to pay for lift passes to do that, but there are a very wide range of routes for them to use. We used our passes for sightseeing – not that there was much due to thick cloud on both mountains. There are also a wide variety of trails in the Valley that do not require any pass. It is worth getting the bike map information centre in the village – which is quite different to the ones issued by the mountain, and show a similar range of trails, and their degree of difficulty. It is worth thinking about this before you go. If you are going to be using the gravel trails, especially those with steep hills you will need nobbly tyres, as the gravel can be loose and slippery. We tried an easy trail around Lost Lake on bikes with smooth road tires and I came off in a pool of loose gravel that buried the front wheel rim and tipped me over the handlebars. Bruising and gravel rash were the only injuries but enough to cause some discomfort. The valley trail system does have lots of marked on road routes for transportation around the village as well as recreational multi use trails a lot of which are well paved and very well marked. The combination of the resort municipality’s map and the excellent signage is enough to keep everyone on the right path. 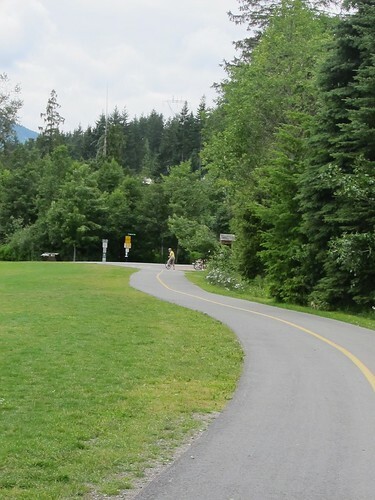 There is also a much longer distance trail along the Sea to Sky part of which is incorporated into the village system. We managed to spend a pleasant day just twiddling along from one end for he village to the other, seeing the lakes on the way and stopping for some very good Samurai Sushi by diverting up to Whistler Creek on the highway. Also worthy of note is that the centre of Whistler is pedestrians only. 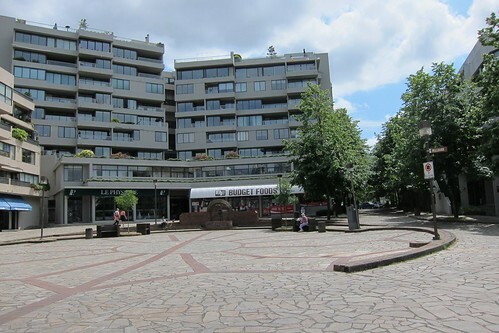 It is basically an open air version of a shopping mall – not straight or direct as a walking route. But since much accommodation is located over the shops – mixed use, what a clever idea – there are a lot of people walking their bikes to and from their lodging. And a few who seem incapable of getting off them: they are usually wearing Darth Vader helmets and armour too. The paved bike routes have yellow centre lines and cyclists and pedestrians alike seem to be better at observing them than any separation system at work here. Though levels of use when we were there were nothing like as heavy as the Seawall on a sunny day. Vancouver can copy the mixed use in retail areas. It ought by now to have achieved much more pedestrianization but I suppose getting separated bike lanes was hard enough and, as far as I know, those barriers seem to be deterring parkers too. 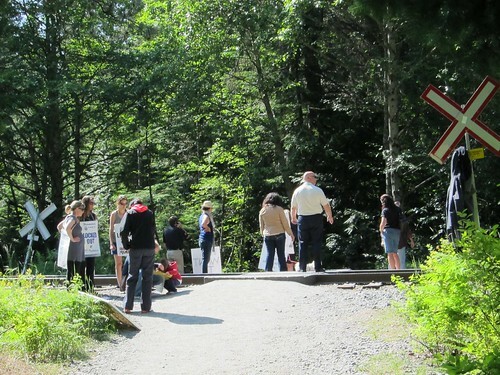 RM Pickets at Brandywine Falls, originally uploaded by Stephen Rees. Rocky Mountaineer attendants have been locked out. RM hired replacement workers and then ordered off the attendants part way through their trip on June 22, 2011. The 108 locked out On Board Attendants are members of Teamsters Local 31. They were in negotiation for overtime beginning after 11 hours (some shifts are 16 hours or longer) improvements to health and welfare benefits and wage increases. In today’s Vancouver Courier Peter Armstrong, CEO of Rocky Mountaineer Vacations complains about the COPE Councillors who have urged him to return to the bargaining table. Armstrong is chairperson of the NPA’s election campaign and accuses the COPE Councillors of “using my employees as a bit of a pawn”. We did not take the train to Whistler as a round trip would have cost us more than the three night’s accommodation. RM has enough money to completely rebrand its trains including new paint for every car and loco. RM has a very high reputation as “The World’s Leading Travel Experience by Train” and the role of the on board attendants is central to that. The company is privately held so I’m not able to comment on its profitability but given its rate of expansion and the high level of its revenues, it does not seem to be short of a few dollars. How it spends them is another matter. In a customer service based business the quality of the staff is paramount. The staff of RM are not pawns of COPE Councillors by any means, but by his actions Peter Armstrong has shown that he is anything but “Non-partisan”. He is playing straight out of the neo-conservative playbook. Perhaps not surprisingly since the only people who can afford his services are the very small percentage of people at the top end of the personal income scales who have been doing very well since the Thatcher/Regan revolution started. When the news radio called me about the Mayor’s “decision” to ask for 2c on the gas tax to pay for the region’s share of the Evergreen Line, I did not think I had much to say about it. After all, it was merely a recommendation – and would have to survive the summer and some public consultation. I recognize that the summer is a slow news time, but the amount of coverage this proposal is now getting is surprising me, though not the level of the “debate” so far. Perhaps the least expected contribution came from BC’s answer to Sarah Palin. “When British Columbians say that they’re not really excited about paying more gas taxes, I get that. Because my focus as Premier is how do we make life more affordable for people rather than less affordable,” she said. The Mayors were given very little leeway: they have to come up with a payment from this region’s taxpayers since the province and the feds have both already committed at their level. Since the current levels of taxes collected by Translink are only enough to keep on a current levels, the only way to raise $400m had to be an increase in currently permitted taxes. There is no time left in the funding agreement to come up with a new source so it either had to be property taxes or the gas tax, and the Mayors had made clear from the outset the very cogent reasons why property tax was not going to be the way they did it. Indeed, quite why our Premier thinks that the people of this region will like to see their property taxes raised is not exactly clear either. There is a $400m hit to our pockets and the only question is what is the most sensible way to do that. Property tax increases are no more “affordable” than gas tax increases. As Geoff Meggs points out this also shows some lack of co-ordination inside Christy’s cabinet. Doesn’t she talk to her Ministers? Or is she deliberately trying to weaken Lekstrom? But Christy does seem to be ready to repeat the steps taken by the last caretaker premier, Ujjal Dosanjh – who went down to a stunning defeat in his last provincial election despite his last minute, and probably illegal, rejection of the vehicle levy. For those of you who are of a mind to stick to the “no new taxes” mantra just take a read of what happened in California when they slashed their car tax. It is becoming very clear that the right wing belief that leaving money in tax payers’ pockets is the right thing to do in any set of circumstances is just that: a belief. Some people believe in Santa Claus too. Faith is holding on to a belief despite all evidence to the contrary. I have always been very much impressed by the American constitution’s requirement of a complete separation between church and state. What I cannot fathom is the right wing’s ignorance of why that is so important. “I stand behind what I’ve committed to,” Lekstrom said Wednesday, adding he has spoken with the premier and ensured they’re both on the same page. But he said the mayors can count on the province legislating the fuel tax increase this fall – as he promised – provided mayors formally vote for it in a pending financial supplement after public consultation and review by the TransLink commissioner. Clark has also penned a letter to mayors pledging her support, he confirmed. I was simply going to retweet a link to Kai Nagata’s blog post . But I think it deserves more attention than that. I will admit I had never heard of him before – he was a journalist at CTV in Quebec, covering the National Assembly. I do not even know why I clicked on the link to read it at first. Just that it grabbed me and held me captive. He is – there is no doubt at all – very brave. And also very honest. And he gives a very clear, succinct and credible analysis of what is wrong with tv news in Canada. Which, by extension, tells us a lot about ourselves. I strongly recommend to my readership that they set aside a few moments to read it from beginning to end. I have no idea where Kai Nagata’s quest will take him but I suspect this is not the last we shall hear from him. And I suspect we will all benefit from his decision to leave CTV News and go and do something more worthwhile. I wish him the best of good fortune. Leg in Boot Square, originally uploaded by Stephen Rees. The design is based on a Italian hill village. Very carefully designed public space that does not work. Gordon Price said that this was because it is inaccessible by car. I disagree. I think it does not work due to the lack of tables and chairs. A couple of fixed benches is not enough. In an Italian hill village there would be at least one cafe and a bunch of market stalls too. There are three destination restaurants/pubs a short distance away – on top of the marina. Simply allowing uses in the retail spaces that gave people on the seawall a reason to stop would bring life to the square.